Mathrubhumi Daily did an exhaustive coverage of the event at Karunagappally and the Sainik School campus on 10 December, 2011 featuring the Commemorative meeting in Second Lt Radha Mohan Naresh’s hometown and the unveiling of his bust by a grateful and proud School Alumni. 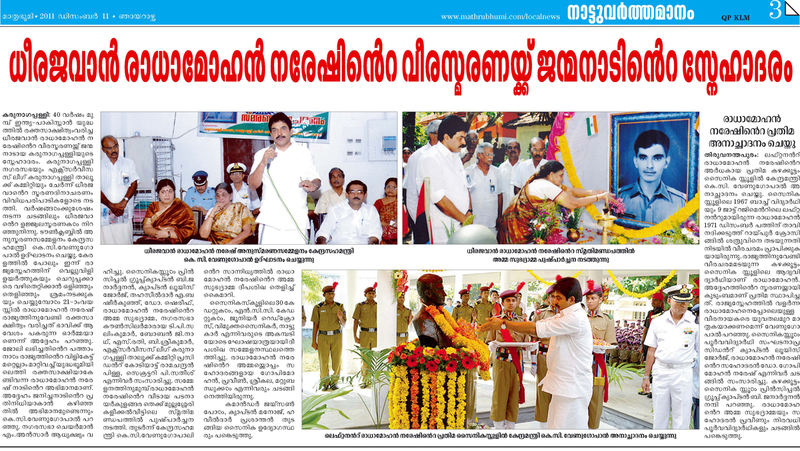 From the Mathrubhumi, Kollam Edition. Made available by CN Suresh, (R No 721/ Class of 1976). Please click on the image for a larger image resolution and higher degree of readability.